Live from Carrolton, Georgia tonight… Georgia is a key state for Gingrich on Super Tuesday next week. 8:09 Joking about his age, Gingrich points out that he’s met people who tell him their dad was their former student when he was a college professor, introduce him to their son. 8:17 CNN breaks away from live feed of Gingrich speech. This is a look at the race in the battleground states during the last week before the election. They will ultimately decide whether Barack Obama or John McCain wins the presidency. As I have said repeatedly, Obama has more options than McCain to reach the 270-vote threshold to win the race. There is even a possible scenario where Obama can win the race without Florida, Missouri, Ohio and Pennsylvania – four out of the five biggest swing states up for grabs. To use a poker analogy, McCain has an inside straight and has no room for error. The Obama campaign had conceded Arizona months ago on the assumption that it was a lock to vote for McCain. A series of polls during the final week before the election showed Obama cutting the deficit to single digits within the margin of error, leading to a last-minute blitz in ad spending. Now, they have forced McCain to play defense in his home state when time and money is running out, which is good for the Obama campaign at this point because it means he has less time and money to spend in more competitive states. Prediction: McCain wins by 2-5 points. Multiple polls show Obama leading here. The McCain campaign publicly insists that they’re competitive here, but in private some are saying the state is gone. Given that the NRSC has also given up on spending money on behalf of the Republican candidate in this race, it is an implicit concession that the GOP will lose the state up and down the ballot. Prediction: Obama wins by 4-7 points. With all due respect to the late Tim Russert, this election will not come down to Florida, Florida, Florida. McCain was ahead for a long time but Obama caught up to him and it is now a tossup. McCain and the Republicans will manage to hang on to it. Prediction: McCain wins by 1-4 points. This has been a solidly Republican state for years, but given record numbers of African Americans who are going out to vote and a surprisingly close Senate race between Saxby Chambliss and Jim Martin, the Obama campaign sees an opening and is spending money on TV time there in hopes of pulling off an unlikely upset. Prediction: McCain wins by 7-10 points. This is one of the most reliably Republican states in the country, although they have been known to elect Democrats for congress and governor. Obama is competitive here in large part because of the Chicago suburbs in northwest Indiana, many of which have large African American populations. He almost pulled off an upset against Hillary Clinton here, losing the primary only by single digits. It’s given Republicans a scare, but they will hang on to it. Prediction: McCain wins by 3-6 points. This is where it all began for Barack Obama’s improbable quest for the presidency, with an upset win over Hillary Clinton 10 months ago. 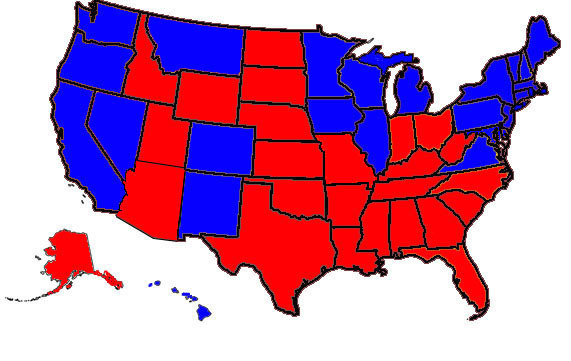 This was one of only two states that Bush was able to flip in his favor during his 2004 bid. But Obama’s ground operatin in the state, as well as voter concerns about the economy mean it’s pretty much a lock for him. Political observers have been skeptical of the McCain campaign’s decision to spend time and money here when most polls indicate the state was not competitive. Prediction: Obama wins by 8-11 points. Considered by many political observers to be the bellweather state to watch, since it usually winds up in the winner’s column in every election. There are signs of optimism on the ground for the Democrats but in the end, it will stay in the Republican column. Montana has not voted for a Democrat since 1992, and that was largely due to the fact that Ross Perot siphoned off a majority of his votes in the state from President George H.W. Bush. A similar scenario might be in play this year: Ron Paul is on the ballot as the Constitution Party candidate, and you also have to remember Libertarian candidate Bob Barr. In a close race, Paul and Barr could take away enough votes from McCain to play spoiler and tip the state for Obama. Also in Obama’s favor is the fact that the highly popular Democratic governor Brian Schweitzer is up for reelection, and that Republicans failed to find a meaningful challenger to Democratic senator Max Baucus. Prediction: Obama wins by 1-4 points. John McCain has a long history and deep affection for New Hampshire voters, since they were the ones who gave him key victories in the state’s primary in 2000 and 2008. However, given the Democratic tilt of New England, especially after the 2006 elections when many moderate Northeastern Republicans were ousted by voters, it will be very difficult for McCain to win this state. Prediction: Obama wins by 6-9 points. A significant Hispanic population, a popular Democratic governor, and an open Senate seat, all good signs for the Democrats. This was the other state that flipped from the Democrats to the Republicans in 2004. The NRSC has given up on its efforts to hold on to the seat of retiring Republican senator Pete Domenici, and the McCain campaign has practically conceded this state already, even if they didn’t state so explicitly. Prediction: Obama wins by 9-12 points. Two things working in Obama’s favor: the state’s large Hispanic population and that the urban areas in the southern part of the state (Las Vegas and the suburbs and exurbs) are his strongholds in the state. Kerry narrowly lost here in 2004, but political oddsmakers in Vegas and elsewhere expect an Obama win this time around. Prediction: Obama wins by 3-6 points. North Carolina has not voted for a Democrat since Jimmy Carter in 1976, and they did not get behind native son John Edwards when he was on the ticket four years ago. There are two reasons why this state is competitive now: a large African American population and economic woes in the region. Also helping Obama is a Senate race where the unpopular incumbent is likely to lose, which could help his chances at the top of the ticket. In the end, these are enough to make the state competitive, but not enough to put it in the Obama column. This has been another reliably Republican state until late polling showed the spread within single digits, leading to a last-minute ad blitz by the Obama campaign. They’ve elected Democrats to the Senate and the House in the past. It’s going to be close, but Republicans should be able to keep it. Two historical facts you will hear over and over again on Election Night: First, this is the state that got George W. Bush reelected four years ago. Second, no Republican has ever been elected to the White House without carrying Ohio. The state has been hit hard economically, making it a ripe pickup opportunity for the Democrats this year. Polls give Obama a narrow lead, but McCain can still pull it off, especially if the Joe the Plumber attacks proved effective at raising economic doubts about Obama among undecided voters. John McCain’s strategy for victory hinges entirely on winning Pennsylvania, where polls show him trailing Obama by as much as double digits. The Obama campaign must be feeling pretty good about this state, considering they don’t have any visits planned there between now and Tuesday. McCain may make his last stand here. If the networks call this state for Obama, he will have to make up the difference elsewhere, and he has very little room for error. Prediction: Obama wins by 5-8 points. This state has been a lock for Republicans since 1964, but Obama’s early organizing and spending efforts have paid off. Democrats have won three consecutive statewide races (two gubernatorial elections in 2001 and 2005, a Senate seat in 2006) and former governor Mark Warner is a slam dunk to win the Senate seat being vacated by John Warner. When McCain surrogates insult the Washington DC suburbs which account for one third of the population of the state, that’s not going to do them much good. Expect Virginia to go blue for the first time since another Arizona Republican was the presidential nominee. The blue collar states in the Appalachia region were considered Obama’s big geographic weak spot during the primaries against Hillary Clinton. But despite having two Democratic senators and a Democratic governor, the rural socially conservative West Virginia tilts to the GOP. Once the race became about the economy, the polls tightened again here, as in the rest of the country. The state that puts Obama past 270 is an interesting question this year because of the number of reliably Republican states Obama has made competitive. If Obama wins North Carolina and Virginia, it will be a relatively early election night because those two states combined are worth 28 votes, one more than Florida. If Obama manages to pull off an upset in an early state on the East Coast (Georgia, Indiana), then it will be game over very quickly, potentially by midnight Eastern time once the numbers for Midwestern states start coming in. Based on my projections, my sense is that the evening progresses and states on the East Coast and Midwest begin falling in line, it will be a state from the mountain West that puts him over the top. My prediction is it will be Colorado or New Mexico.